It may not be the most straightforward classic drum machine emulation, but Heartbeat is powerful, endlessly entertaining, and sounds truly thunderous. Heartbeat is a new drum machine plugin (VST/AU/AAX) from Swedish developer Softube. 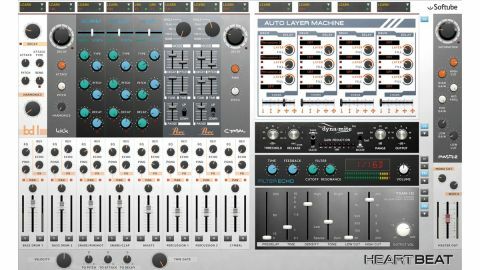 Inspired by, rather than a direct emulation of, classic 80s drum machines such as Roland's TR-909, TR-808 and TR-707, it features eight instrument engines: Bass Drum 1, Bass Drum 2, Snare/Rimshot, Snare/Clap, HiHats, Percussion 1, Percussion 2 and Cymbal. Each instrument has its own mixer channel with auxiliary reverb and filter delay effects, a Ping/ Pong autopan effect, regular Pan, Mute and Solo controls, and one-knob instrument-tailored EQ. The master section includes an adaptation of Softube's Valley People Dyna-mite emulation for dynamics control, plus EQ, stereo image (Width), valve Saturation, and a monoising filter. Heartbeat's sounds are mostly generated using modelled analogue synthesis, although the Kick, Snare and HiHats instruments mix sampled waveforms in, too. There are global settings for overall Velocity sensitivity and the impact of Velocity on Attack, Decay and initial Pitch, plus a shortening parameter called Time Gate that sets a global decay time for all instruments (20ms to 100s), and the Auto Layer Machine MIDI input manipulator. Surprisingly, though, there's no onboard sequencer. Softube doesn't actually name the drum machines that Heartbeat is based on, but their descriptions are close enough to deduce that Bass Drum 1 and Bass Drum 2 emulate, to some degree, Roland's TR-909 and 808 respectively. Both give you more parameters to play with than the originals, however, with BD1's Attack Type and both instruments' Harmonics controls and tailored EQ, in particular, delivering a very broad range of sounds. As a consequence, if you're used to working with the real things or other emulations thereof, the extra flexibility actually makes recreating those classic sounds a bit trickier, although the manual includes some suggested settings. The two snare instruments (SD Rim and SD Clap) are very flexible, with each component (Wave and Synth) including its own Type, Pitch and Decay controls, and the mix between the two set using the top slider. For SD Rim, Wave Type shifts smoothly between Snare and Rimshot, while Synth Type moves from Tone to Noise; for SD Clap, both Wave and Synth controls move from Snare to Clap. Again, a wide range of sounds can be produced, and the manual provides suggested settings for classic sounds. The HiHats instrument responds to two MIDI notes for closed and open sounds, the former choking the latter. Sound generation moves from Electronic to Acoustic (Wave Type) and Metal to Noise (Synth Type), with Pitch and Decay controls on hand for both. The only downside is that both open and closed hats share the same synthesis parameters, so they always have the same tonality, the only difference between them being that open sounds for longer than closed. The two Percussion instruments are identical, with five transformative Modes on offer, as well as Decay, Pitch, Tone, bend Time, bend Range and bend direction (Up/Down) controls. Single and Dual Modes use one and two triangle wave oscillators respectively, for classic syn toms and cowbells; FM and FM+N (noise) deliver metallic sounds; while Noise provides shakers and resonant noise zaps. Finally, the Cymbal instrument makes high- frequency, noisy cymbal sounds of the characteristic early 80s variety, with the Ring parameter providing some extra attack. Heartbeat includes two aux effects - Filter Echo and TSAR-1D Algorithmic Reverb - summed to the master output before the Master EQ. Filter Echo produces both regular and tasty dub-style filtered delays, while TSAR-1D (a simplified version of Softube's TSAR-1 plugin) delivers tight to large spaces with good tailoring of frequency content. Each includes a Pre option, for positioning before the Dyna-mite module. Dyna-mite is a super responsive VCA-style dynamics processor that operates in three main Modes: Slow (compression), Fast (limiting) and Gate - augmented by Bass Drums Duck mode. Slow Mode has a slow enough attack to allow snappy compression of beats, while Fast Mode nails transients head on. In either Slow or Fast Mode, engaging Duck makes BD1 and BD2 duck all the other instruments, for clarity in the mix. In Gate Mode, turning Duck on sets the gate to respond solely to BD1/2. The net effect of Bass Drums Duck is that it makes Heartbeat's kicksfeel removed from the compressed signal, which can be very useful. The Master Bus EQ is a 'broad brush' design with High and Low shelves, a Mid range peak band, and High and Low Cut filters. Meanwhile, the Saturation algorithm gradually adds valve- type harmonics, Width offers mid/sides rebalancing, and Mono Cut mono-ises the signal below an adjustable cutoff frequency. Heartbeat is an excellent, highly tweakable drum machine, and we had a ton of fun trying to recreate classic sounds with it, while also revelling in the new noises it brings to the percussive table. Much of the latter is down to the flexibility of the parameters, especially the Bass Drum Harmonics option and extensive Type settings in the Snare and HiHats instruments. However, it's not always easy to achieve recognisable old-school sounds with it, and certain tones - TR-909 crashes, for example - are beyond its capabilities. We're also amazed there's no onboard sequencer, as any vintage- style drum machine should really have one. If you view it for what it is rather than what it isn't, though, Heartbeat is a fine virtual instrument that Softube should be proud of.